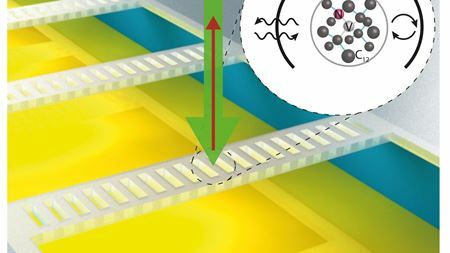 Mirror-like spin-photon interfaces in diamond for quantum memory. Emerging family of solar-absorbing materials that could clear the way for cheaper and more efficient solar panels and LEDs. ETH researchers have developed a comprehensive model to explain how electrons flow inside new types of solar cells made of tiny crystals. Researchers hope that their properties might be altered to permit nanodiamonds to be used as catalysts for generating hydrogen from sunlight. How to enhance light emission and capture light from metamaterials embedded with light emitting nanocrystals. Submit your entry to the Elsevier Innovation Award! The Physics Innovation Award is a competition inviting you to come up with original innovative ideas to improve the publishing experience. University of British Columbia physicists have detected 'charge ordering' in electron-doped cuprate superconductors for the first time. Princeton University researchers have built a rice grain-sized laser powered by single electrons. Physicists have detected 'charge ordering' in electron-doped cuprate superconductors for the first time. Revealing hidden structures in domain interfaces in organic semiconductors. Rice University scientists advanced their recent development of laser-induced graphene (LIG) by producing and testing stacked. Outstanding contributions recognized at the Materials Today Asia conference. Materials engineers have made a significant leap toward creating higher-performance electronics with improved battery life. How fast do electrons move through atomic layers? Researchers measured the time electrons needed to travel through a film consisting of a few layers a of magnesium atoms. We are very pleased to solicit nominations for the Elsevier Van de Hulst Light-Scattering Award. The Editorial Board of Nuclear Instruments and Methods, Section A (NIMA) is currently accepting nominations for the Kai Siegbahn Prize. Resilience to extreme conditions by the most transparent, lightweight and flexible material for conducting electricity. Dr Subhash Mahajan, Coordinating Editor of Acta Materialia, will receive the prestigious Institute of Metals/Robert Franklin Mehl Award. A team of engineers has developed a new acousto-optic device that can shape and steer beams of light at speeds never before achieved. What were your favourite Materials Science news items in December 2014? Carbon black-PTFE Janus microspheres have been produced using microfluidics. A flexible, self-powered piezoelectric motion sensor for use by Alzheimer’s patients has been developed by Korean researchers.